That’s a mouth full. 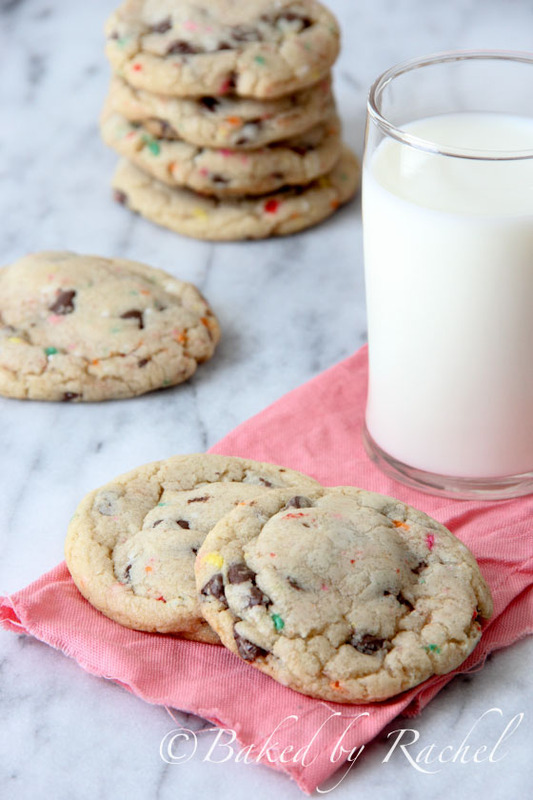 I could just call these birthday cookies, especially since my birthday was last week. And of course because sprinkles and birthdays just go hand in hand. But I like the longer name better. It describes the cookies, but not nearly in the depth they should be described. Remember these incredible NY Times cookies? I adapted them for the cookie brownie bars. Well… I adapted them again because they’re perfection and clearly improving on perfection is necessary. Or that’s what I’m sticking with. They have the best crunch on the outside, not too hard and not too soft. And even better, the inside stays nice and soft. Best of both worlds. I wanted to change them up to be more festive but still amazingly delicious. So in came cake mix and of course rainbow sprinkles. Completely necessary. Sprinkles, like bacon, just make life better – happier even. I went a step further and tested these cookies out without the long 24 hour wait, and while I’m sure the flavors would become even stronger sitting longer, a short visit to the fridge is all these need. Just a touch of chill. What are you waiting for? 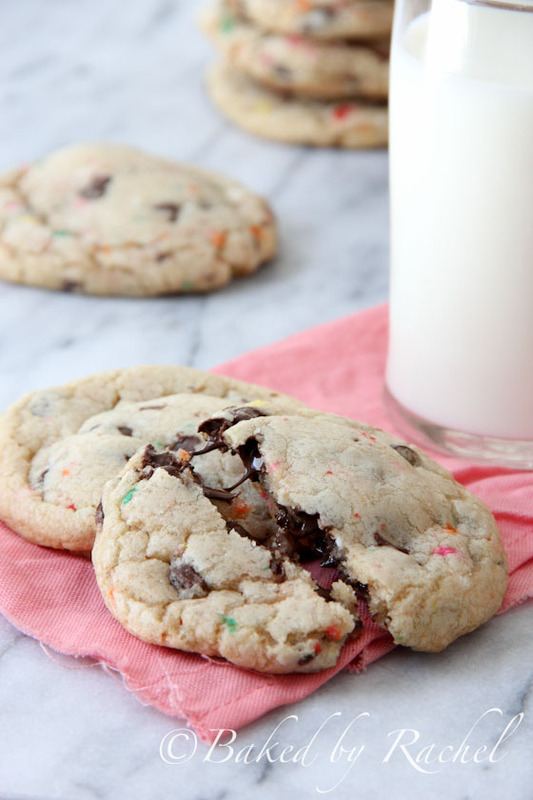 Go make these! PS I highly recommend… no, I insist on eating these while still warm. 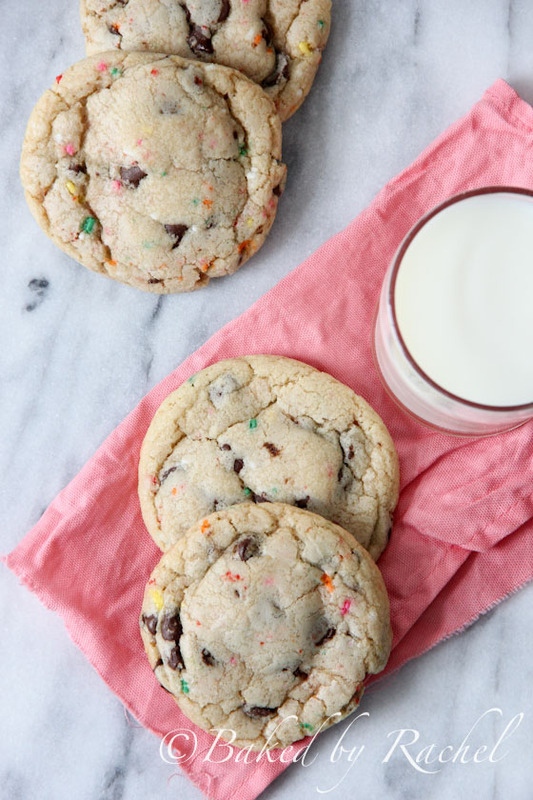 The perfect cookies made even better. A crisp exterior with an inside that stays soft, sprinkles and chocolate throughout with a light taste and scent of vanilla cake. In the bowl of a stand mixer, cream together butter and sugars. Add egg and vanilla, mixing just until dispersed. Mix in flours, cake mix, salt, baking soda and baking powder. Increase speed to medium as needed to combine dough completely. 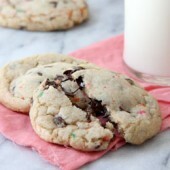 Mix in sprinkles and chocolate chips with a wooden spoon. Cover and chill dough for 2-4 hours or until lightly chilled. Preheat oven to 350 degrees. Line baking sheets with parchment paper. Using a medium cookie scoop, scoop dough and shape into balls. Place cookie dough balls on prepared baking sheet at least 2 inches apart. Bake for 12-14 minutes or until edges are lightly golden. Allow cookies to rest on pan for 2 minutes prior to transferring to a cookie sheet to cool completely. Store in an airtight container.